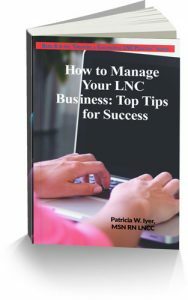 Lorna Kibbey is an expert at business and has tips that will work with your LNC business. She speaks at a large variety of conferences and meetings. She conducts workplace assessments, workshops for teens and workshops for all levels of employees including using a tool called Everything DiSC, which we’ll talk about in this program. What are some common leadership issues? You’ve gotten your LNC business started, you’ve gotten clients, and you want to sustain your success.Business development and client management are intertwined. Both are necessary for a stable business.In this book I tackle how to control your money and your goals, to subdue the evil twins of perfectionism and procrastination, and to get more done through outsourcing. You can reach a stressed out state as a business owner. I share tips for managing your stress and health. Ready to hire an employee? I added a chapter on the process of interviewing and hiring. The second part of the book shares tools and techniques for deepening your relationships with your clients. You will discover how to win over and retain the clients you want and recognize those who are too much trouble. Mastering negotiation, business communication and conflict are essential. I show you how. This is the book to use to build a stable foundation for your business. Get your copy at http://lnc.tips/Creatingseries and get a 25% discount using the code listened. Lorna Kibbey designs and delivers management and leadership seminars and services to public and private sector organizations. Her seminars focus on the many issues surrounding leadership, motivation, and communication. Lorna is a motivational speaker and speaks at a large variety of conferences and meetings. She is certified to conduct workplace assessments; workshops for teams; and workshops for all levels of employees, using Everything DiSC. She earned her Masters’ Degree in Business Administration from the University of South Florida and her Bachelor of Arts in Communication from the University of Cincinnati. Lorna has achieved recognition in Florida as a Certified Public Manager and was recognized as “Best Boss of the Year” in a nationwide initiative.